Back at the beginning of January when I posted my Game Plan 2017 I mentioned I had come up with a list of 50 games I wanted to make sure I was going to play SOMETIME this year. The kids have followed suit and made up lists of their own – though their lists are shorter – Finnegan had 25 on his list and, I think, The Girl has 37… which is okay, they can add to it later – or just play some of those game MULTIPLE times – I suspect it will be the latter – in fact I HOPE it is the latter! Luckily some of the games I want to play most are games that are on all three lists – which means we’ll get to play those at least 3 times this year. Amanda even said she’d pick one game a month – thought couldn’t be bothered to make a list in advance. We didn’t “officially” get started on the lists until the second week of January. The first week was still part of our winter holidaze 12 Days of Gaming. As the end of the second week I did a brief update - I had thought I’d do a little weekly update on the games we’d played each week.. but since I’m already doing a weekly Vimy I thought I’d forego a second weekly update (which I’d probably end up wanting to do on Sunday as well) – at least for now. Maybe I’ll do this at the end of the month for the next few months… or have fortnightly updates… just because I like the word fortnightly and I don’t get to use it nearly often enough! It had been a while since we played this (over a year!) 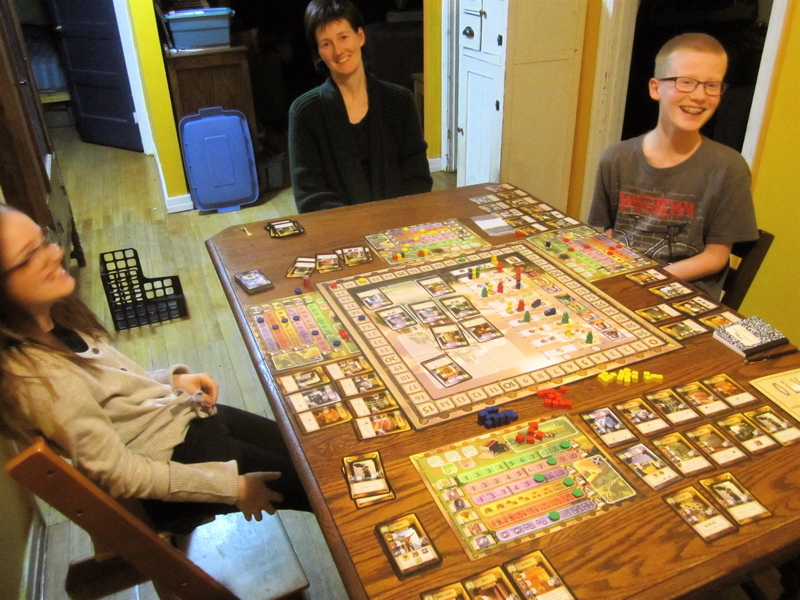 I’m not sure what sparked Amanda’s memory but it was fun to dig it out and play it again. I recalled the getting the Temple of Athena early in the game was a huge benefit and managed to grab it – not only does it give you extra levels of other stuff when your priest worships at the temple of Athena, at higher levels it causes your opponents to LOSE levels in something of their choice – which is nasty. It is one of the few things that mess with your opponents in the game – that and building up your army and raiding them or bringing down plagues by worshipping at the Temple of Apollo. When we last played the kids were a bit younger and didn’t take offensive interactive play very well and everyone pretty much left every one alone and concentrated on building up their stuff. I didn’t do that so much this game. I raised my army up and attacked their cities a few times. I worshipped at the temple of Apollo when I had the last priest and no one else could join in and save themselves from the plague I brought down. But I was only able to do each ONCE. After I did it once, everyone else followed suit and built up their army or would worship at Apollo (taking the victory points instead of the plague) early in the round to prevent me from using such things against them. 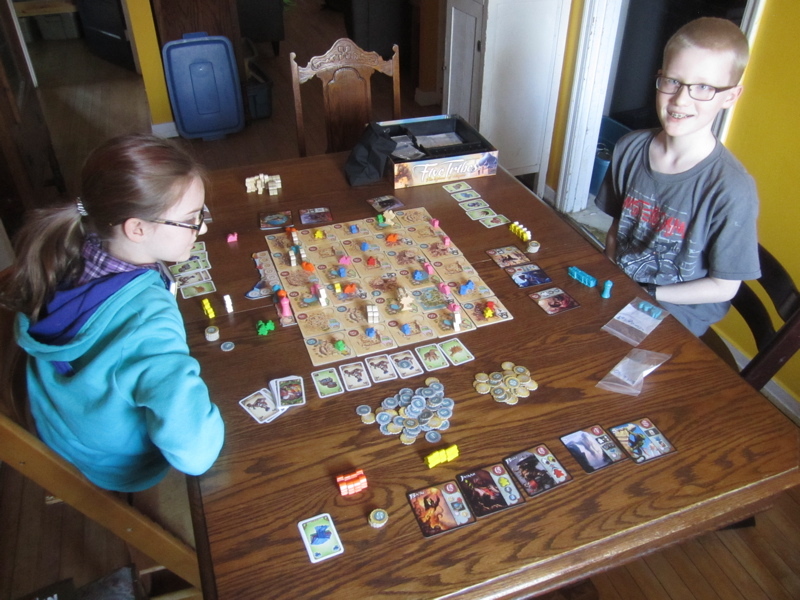 On Monday we played Five Tribes. This wasn’t anyone’s “pick” for the week… we just decided on Monday afternoon that we should play it, and we did. Wednesday we played Race for the Galaxy. This was one of Finnegan’s picks for the month. I didn’t even bother putting games like RFTG or other games that we play in less than an hour (like 7 Wonders or Dominion) on my list as I knew that we’d get in games of them anyway – whenever we had an hour to spare… but Finnegan had it on his list so we picked this for our Wednesday game. 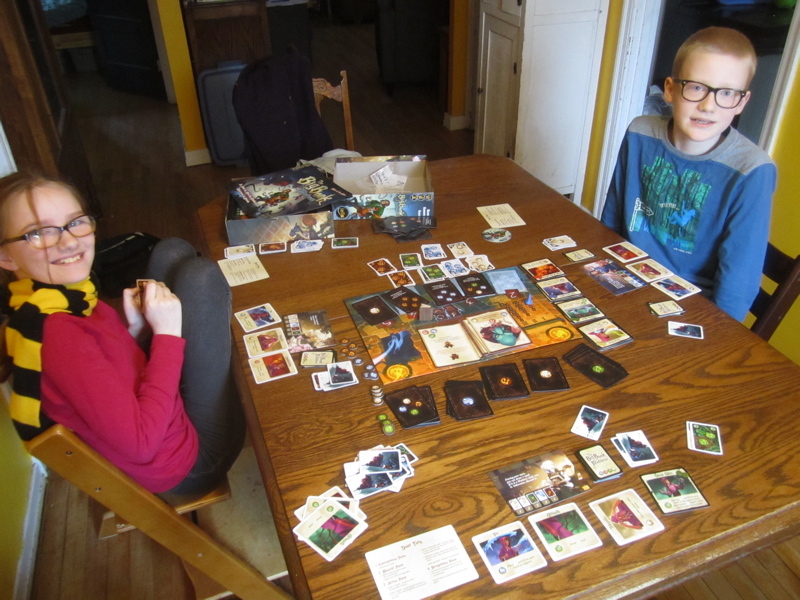 The last few games of RFTG were pretty… I don’t know… unsatisfying…? I couldn’t get a theme going or get anything working together and felt like I didn’t even get started before it was over. This game went a bit better, I got some cards that worked together and had a bit of a theme going. I can’t read those six-cost developments, but I’m sure I had 50-60 points. I’m not sure I even won with that, because the kids also had great games it was all very close and entirely different strategies were taken – The Girl always like setting up production and consumption worlds and just producing and consuming for 2x victory points and usually does pretty good with that – racking up VPs with just a few worlds while were all scrambling to fill out our tableaus before she eats all the VPs. Friday we had another crack at The Big Book of Madness. This is a co-operative, deck-building game where all players are students at a school of magic where one of the students went looking through the restricted section of the library and accidentally unleashed a bunch of horrors into the school and the players are busy trying to banish them all before they take over and everyone goes mad. WE tried to play this as a five player game over the holidaze and lost – big time! It was SUPER hard and was almost unimaginable how the game could ever be defeated. Well… playing with fewer players is one key to the game. You face 6 monsters in the game and have rounds to deal with them – so 30 rounds. 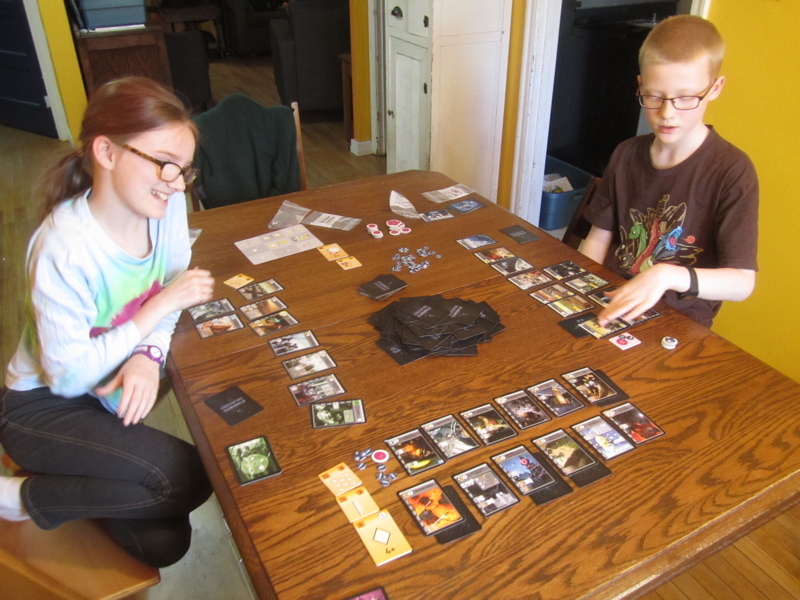 In a five player game that means everyone gets on round of play per monster and a total of 6 rounds of play in the entire game (if it lasts that long) which is precious little time to advance your character – build up your deck and get better spells. Saturday I spent the day at FreezerBurn VII (an annual invitationa game day hosted by my firend John) and played Small World, Roll for the Galaxy, Age of Industry, Viticulture, and Power Grid Deluxe. 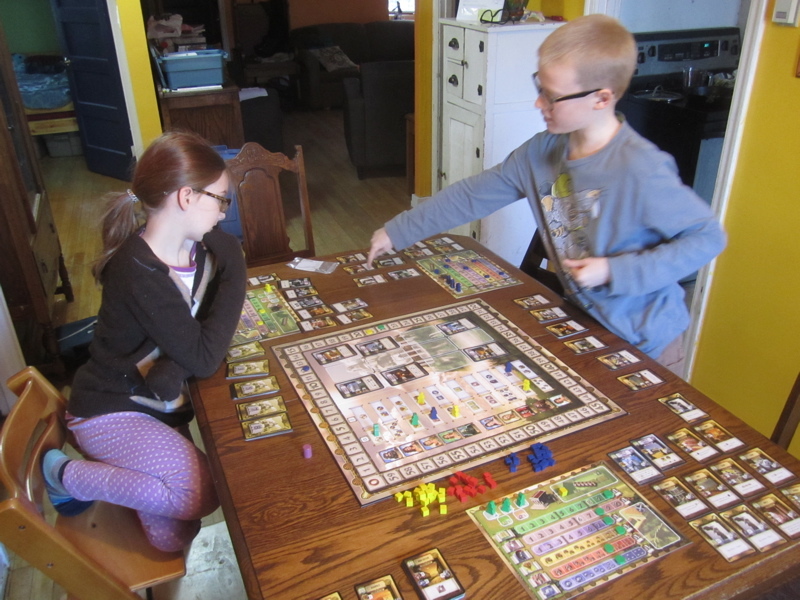 As Power Grid Deluxe was on my list, I counted it as one of my picks for the week. 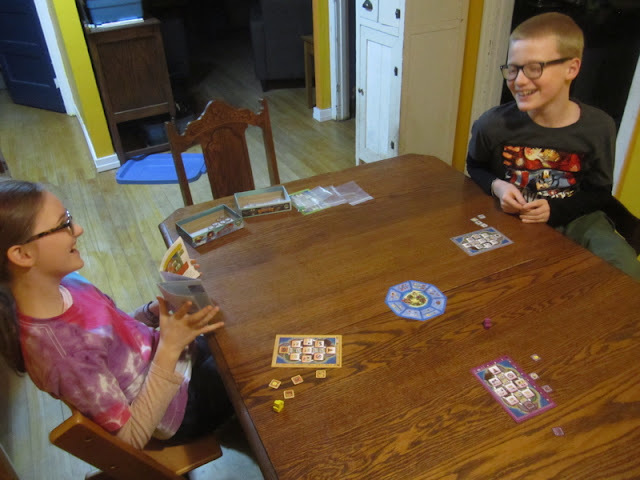 During the last week of January, on the Wednesday, we played Olympus again – it was one of Finnegan’s picks and he wanted to play it again while it was all still fresh in his head. They let me get the Temple of Athena again – though The Girl did try to scoop it, I was quicker… I think she went for the 2 VP from Apollo EVERY TURN through the whole game – which put her in a pretty commanding lead and had me wondering if that was maybe a pretty good strategy to do that through the game… until we did the final points tally and Finnegan and I raced WAY ahead of her. Monday, 30 January, we played Bottlecap Vikings. The Girl won this game at a local event at Dragon’s Den Games for International Tabletop Day last year (which I thought I had done a post about… but can’t seem to find it..? Maybe I just posted pictures on facebook…) – and she has been HOUNDING us to play it ever since… I have to admit I’ve been reluctant to try it out – mostly due to the name. “Bottlecap Vikings”? Seriously? WTF is a Bottlecap Viking!? That and that fact that it’s supposed to take 15 minutes to play didn’t strike me as a game that would be very interesting. I guess I should have been so prejudiced (and then surprised!) – Love Letter is a very quick-playing game that is a lot of fun. Finally… at the very last moment we got in The Girl’s last pick for January: Submarine. This is another game we haven’t played for over a year and a half. The kids weren’t pleased with me (as may be evident in the picture). Rereading the rules I quickly ascertained that this game really isn’t about picking up the treasures as it is about card management and always trying to make sure when someone else picks up a treasure they have to give you a card as well and positioning yourself to give up a minimum number of cards when picking up treasure yourself – you start the game with a finite number of cards. In a three player game everyone starts with a deck of 15 – from which they draw a hand of three. Every time you pick up a treasure you have to play a card of the matching colour. If there are submarines of another player in the same space of above you in the same column, you have to give a card off the top of your deck to the other players for each of their submarines so positioned – which they then place on the top of their decks. Earlier this week we sat down and tried to plan out what games we’re going to play for the next month – trying to fit in all the games we want to play around all the stuff I need to do for the Vimy Project, and all the kids activities and… y’know… actual schooly-stuff… Luckily there is a stat holiday in February followed by a week-long school break – one might think the school break wouldn’t matter to us (being homeshoolificators) but when there is a school break, it usually means all the kids other activities (dance, violin, karate, swimming, theatre school, etc) are all cancelled which frees up a LOT of time. (I’M hoping to get a lot of terrain building done over the school break!). The Girl picked Space Junk, Linkage, Agricola, and Smash Up. Finnegan wants to play Small World, A Study in Emerald (Second Edition), Arkham Horror, and Firefly. My games for the month will be A Game of Thrones, Railways of Mexico, Pax Porfiniana, and Illuminati (which I haven’t played in YEARS – probably even a decade!). 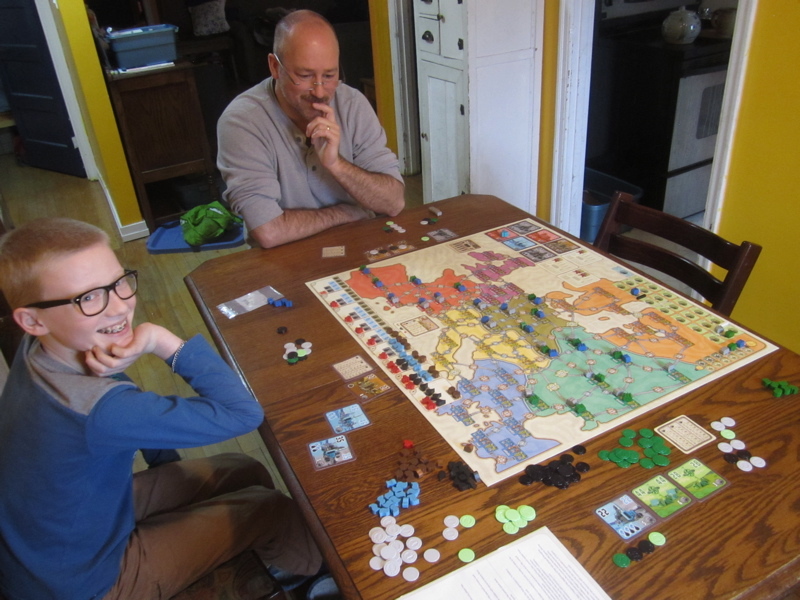 Amanda decided her game for the month would be Nations. 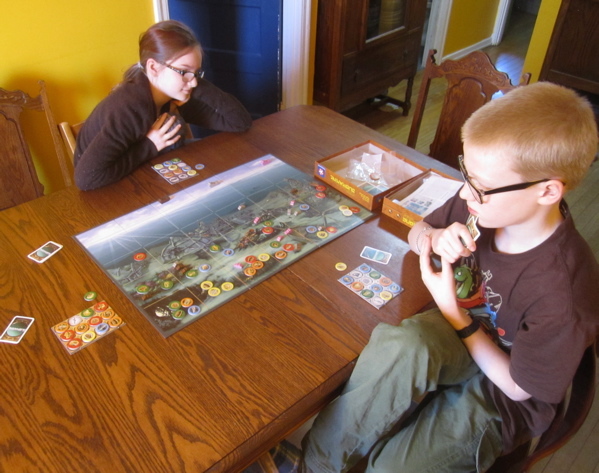 So today we are playing Smash Up and A Study in Emerald (Second Edition) on Saturday. Next week is probably Railways of Mexico on Wednesday and Firefly on Saturday. The following week is Small World on Wednesday and A Game of Thrones on Saturday, Agricola, and Nations on Monday (that’s the long weekend). I think we were going to play Space Junk one of those evenings. Sometime during the break the following week we’re going to play Arkham Horror, and finally – on my birthday (Saturday, 25 February 2017) we’re going to play Pax Porfiniana in the afternoon and Illuminati in the evening! We didn't get to playing any skirmish miniature games last month, but I'm hoping we might get to that on Sunday evenings this month... or maybe every other Sunday evening...? You have an enviably busy gaming life, sir! We do play a lot of games. It's kind of our thing. Good on you I say! Half your luck. We play as many as we can but nothing like your efforts. Good luck fitting in the minature gaming in that shedule! I was thinking I should probably hold off on the miniature skirmish gaming until after this Vimy business is all done... but there are SO MANY miniature games I'm REALLY EXCITED about RIGHT NOW!!! The level of excitement is bordering on distracting. Part of me feels like "well maybe if I play a game it will sate that desire for the moment and allow me to carry on..." of course, it could also just get even more fired up and thus MORE distracted!? GAH! ?